Received these babies from a neighbor last night!! So excited to make goodies out of them…. thick cut juicy tomatoes, fresh Moz.. hearty drizzle of reduced balsamic…. delish!! So what is a bisque exactly ? 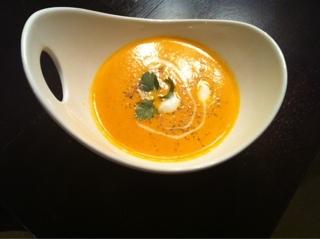 According to Wiki , Bisque is a creamy soup of French origin, based on a strained broth of crustaceans. Sautee onions and garlic in a Tbsp o OO for 4-5 minutes till the onions turn a pale pink. Add the tomatoes and carrots and cook for about 3-4 minutes on medium heat. Add the bay leaf , basil and water. Increase the heat to a high and bring the soup to a boil. Reduce the heat to a medium and cover the pot and cook for 12-15 minutes till the carrots are tender. Once the carrots can be pricked easily with a fork, remove the bay leaf. Using a hand blender, blend the contents in the pot carefully or alternatively using a stand up blender, blend all the ingredients. ( I would suggest letting the ingredients cool down before blending). Move the contents into a pot and add the coconut milk and bring to a gentle boil. Season with salt , pepper and nutmeg. Garnish with some fresh basil and a Tsp of coconut milk.